Aleppo Marriage Database - 1354 records – For the most part, the data covers 1847-1850, 1868-1877, and 1893-1934. 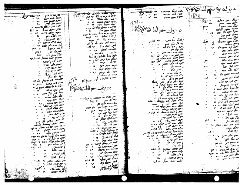 However, we included a few records found in 1811and 1855 that were derived from Ketubot manuscripts. Cemetery records from the Sephardic cemetery in Guanabacoa, Cuba. Cemetery records from of Aleppan Jewish community in Mexico City, Mexico. These records include Panteón Jardín Nuevo and Panteón Jardín Viejo, operated by HEBRA KADISHA, COMUNIDAD MAGUÉN DAVID.